Polyester insulation (isotherm) is made from recycled PET bottles. Plastic drink bottles are also recycled to reduce landfill. These bottles are heat bonded and there are no use of chemicals or any added fire retardants like boric acid (used in cellulose fiber insulation) that could be harmful to you. Both think green insulation and isotherm are made from recycled bottles. The fire retardant properties of polyester insulation are NON toxic and completely natural. In fact it’s pretty much the same polyester used in duvets and pillows. Will it lose its thickness over time? When choosing the right ceiling insulation for your home or office, you want to make sure it will maintain its thickness and R-value over time. Insulation that compresses over time is not worth having because the thickness you pay for today will drop, and so will the R-value, a few months down the line. Polyester insulation will not compress over time, its thickness is locked because it is a bonded blanket. Insulation that comes in roll form cannot be disturbed by strong winds, where the insulation in loose fill form could be blown around reduce thickness in some parts of your roof while increasing it in other parts. 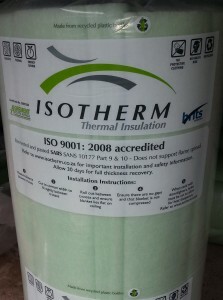 Isotherm insulation (polyester insulation) has been tested and safe to use in commercial and residential building. Isotherm has received a B/B1/2 fire classification rating. Polyester insulation will not spread flame and will self-extinguish once the flame source has been removed. If the polyester insulation ends up in a fire it will not release any toxic fumes, this is the same with fiberglass insulation, and they both have not been treated with harmful chemicals.